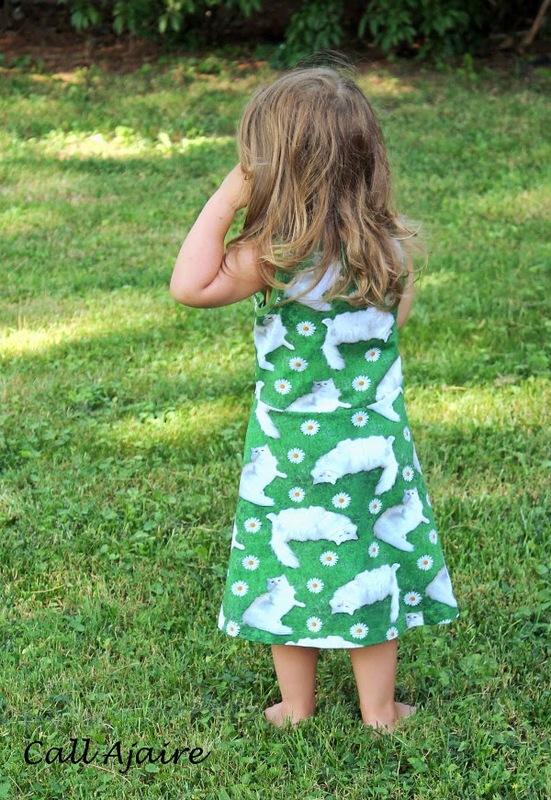 Can you believe I had never made a Skater Dress (the original for little girls) until yesterday? It is one of those patterns where I have loved all the versions I’ve seen out there and just never got around to buying. 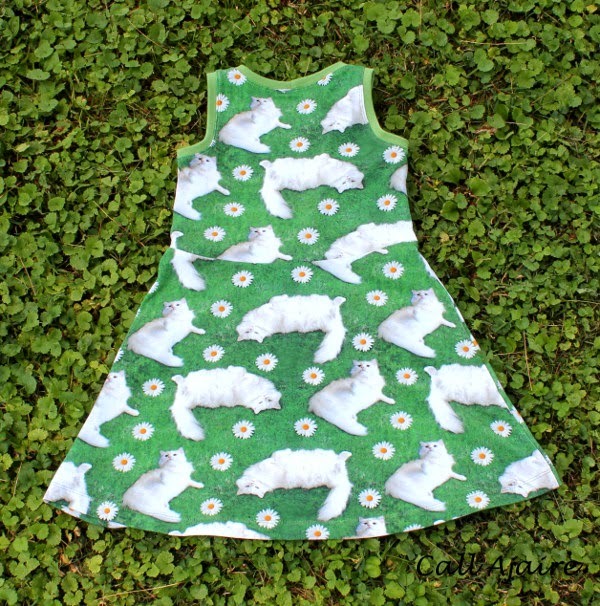 Then I saw Amanda was stocking this CAT FABRIC and I knew it had to be used for a skater dress. By the way, I’m not an affiliate of Kitschycoo. I just fell in love with this fabric and pattern and had to share it with all of you! Come on, those are REAL CATS. The fabric is nice and soft and stretchy which kind of surprised me with such an amazing print. I figured it’d be a little stiffer than it is so that is a plus. I also prewashed it and there doesn’t seem to be any fading so I’m impressed with it so far. Anyway, back to the Skater dress. I cut and sewed this dress in about an hour so it’s an extra fast sew. I opted for sleeveless since it’s already thick and hot Maryland summer here and I wanted an easy on/off dress for to and from the pool. I know for sure I’ll make a bunch more Skaters before the summer is out. The fit is perfect for a 3/4 where Bean is on the lower end. I’m hoping this will work even next spring if the fabric holds up. The length looks like it’ll give us lots of room to grow. 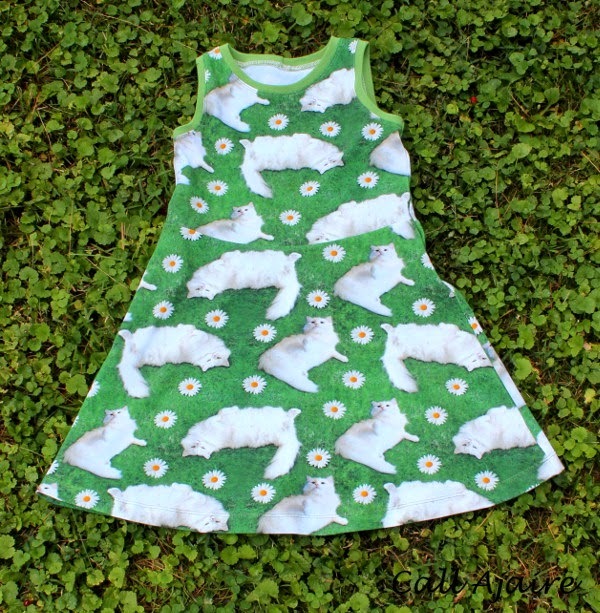 Bean declared this dress a win. She loves the cute kitties and was petting them for the rest of the afternoon. 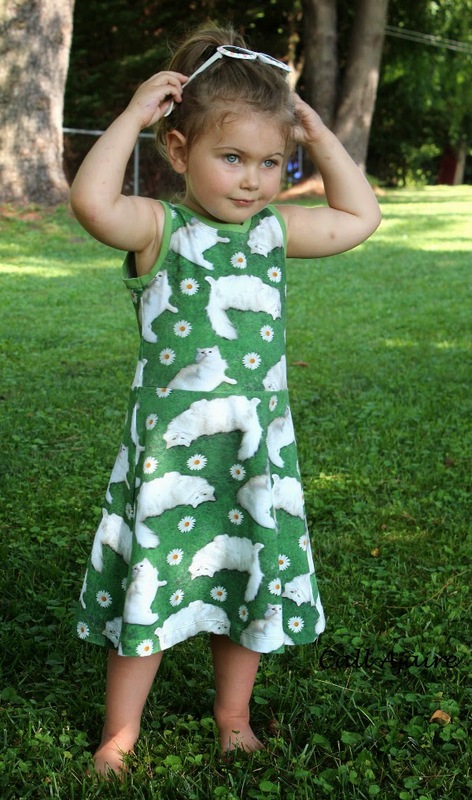 I have a feeling this will be worn a ton this summer so I hope she gets all the creepy dress petting out of her system while we’re still safe in our own backyard, hehe. Thanks Magda! I just adore that cutout from the Shandiin and I knew it had to be a swimsuit. The cosi was a perfect match. The cat fabric is perfect! I can see where Bean would be petting the kitties. There would be lots of that around here too. Creepy cat petting, bahahaha! Very sweet! This is so adorable – and so is the little person in it. I caught my 5 yo scrolling through the photos here when she was supposed to be cleaning her room! I LOVE using school glue to keep the binding down while I'm sewing it (I do not sew by hand). Looks like she found some sunglasses. She was pretty interested in mine! Donna it's pretty funny. She walks around saying "they're so cute!"